Spend your summer at MSOE with FIRST Robotics programs for all levels. Whether you've never heard of FIRST before or you're a seasoned competitor, MSOE has camps designed for every level of student! Design, build and code your own robot during camp. Students participating in FIRST Robotics will leave with helpful tips and tricks to help them during the competition season. Students who complete beginner level programs are eligible to attend advanced programs in the same area (FLL or FTC) in the same summer. Students who already have mastered the skills of beginner camp are encouraged to apply for our intermediate camp. Registration ends Friday, May 10 or when spaces fill up, whichever comes first! PAYMENT PLANS ARE AVAILABLE FOR ALL PROGRAMS. Please contact stem@msoe.edu for more information. 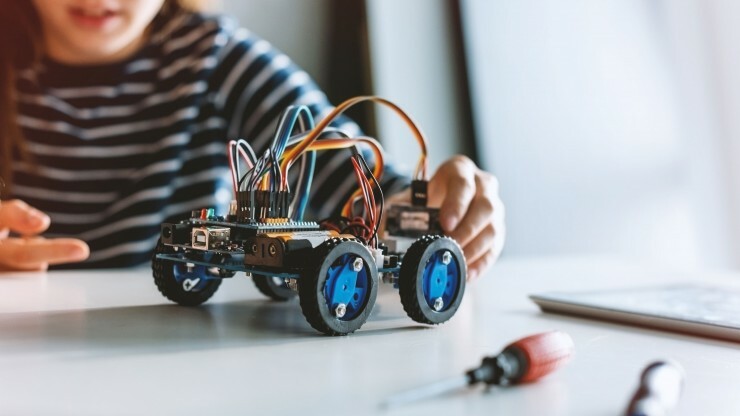 June 17–21, 2019 | Half Day: 12:30 – 4:30 p.m.
Students will learn how to code a Lego Mindstorms robot as well as how to select and control mechanical components. Students will use their robots to complete missions on an official FIRST Lego League game board from a previous challenge year. June 24–28, 2019 | Full Day: 8 a.m. – 3:30 p.m.
Students will explore a new kind of sensor each day on the Lego Mindstorms robotics platform. Each day students will learn to code, build and use their sensor to complete a daily challenge in teams. On the last day, students will combine their knowledge of all sensors to compete in a grand challenge. July 29–August 2, 2019 | Full Day: 8 a.m. – 3:30 p.m.
Students will use the FIRST Tech Challenge (FTC) TETRIX robotics platform to design, build and program a robot to complete the 2019 FTC competition challenge, Rover Ruckus. During the week, students will learn to how to program their robot, how to design & build the mechanical components, and how to work in teams leveraging the engineering design process to complete all challenge tasks. The final day of the camp will involve teams competing in the Rover Ruckus challenge on the official FIRST playing field. NOTE: This beginner session does not include learning how to program the robot for the autonomous phase of the FTC challenge. August 5–9, 2019 | Full Day: 8 a.m. – 3:30 p.m. Designed for students who are looking to take their FTC skills to the next level, the FTC intermediate session will have students to design, build and program a robot to complete the 2019 FTC competition challenge, Rover Ruckus, with a special emphasis on success during the autonomous phase of the challenge. The final day of the camp will involve teams competing in the Rover Ruckus challenge on the official FIRST playing field. Students in this session should already know how to program the TETRIX robotics platform and be familiar with designing & building an FTC robot. Additional information will be sent out to participants 2 weeks prior to the camp start. Note that drop off begins no more than 15 minutes before class starts and pick-up ends 15 minutes after class ends. Limited scholarship opportunities are available for students who qualify for free/reduced lunch. Please contact meilickem@msoe.edu for more information. Applications for these opportunities close on April 26th.